Took Shunkar (usually known as simply “Bird ” or “Birdbrain”) out today for his fist lesson on the lure. He spent a lot of time just staring, amazed, but he was hungry and got to the lure eventually. Derb is on the evo beat– the book he recommends sounds like a winner, and I have put it on my Wish List. But “Intelligent” Design shows no sign of going away– the bill he opposes here just passed. Mrs P on the peculiarity (ahem) of our state seal. When pigs fly: Australia liberalizes its gun laws. This George Will column touches at least peripherally on something that occurred to me: will Keller, counterintuitively, mean that McCain gets FEWER votes because those motivated to vote for him solely to defend their right to bear arms now feel less urgency? Is Thomas Jefferson resonsible for the ranchette epidemic? Small Polish farms devastated. Subsidies for Big Ag are evil. Tibet’s parasitic medicinal fungus is discovered, and suddenly everyone wants a piece, with predictable results for the environment. China of course plays a part. Luckily (though not much info is given here), American ingenuity seems to have figured out how to grow it “domestically”. 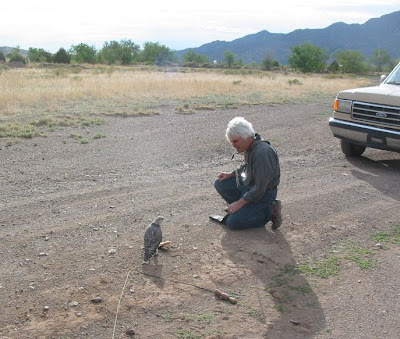 A mountain lion eats a New Mexican, not too far from here. Though I worry more about them getting my dogs, I’ll continue to go armed in lion country. An unusual piece for the NYT: hunting hogs with pitbulls! (And no sign of disapproval.) HT Dr Hypercube, whose site has been so full of good things, from books to terraria, you should just go there immediately and follow all his links. For fans of the American Museum of Natural History in New York (since my childhood not only my favorite museum but the Platonic ideal of a museum) comes this is a splendid link to photos of its history, including all manner of taxidermy, diorama building etc. (HT Brian at Laelaps.) Those interested in such subjects should also check out the latest issue (number 6 ) of the online magazine Antennae which is devoted to new “art” taxidermy. Antennae is a sort of avant- garde scholarly mag about animals, but less forbidding than that sounds. You can download it as a PDF, which is worthwhile for the fantastic images alone. Bats get no respect, and many are in trouble. Carel Brest van Kempen blogs about them here. Big changes in bird phylogeny coming after new studies. 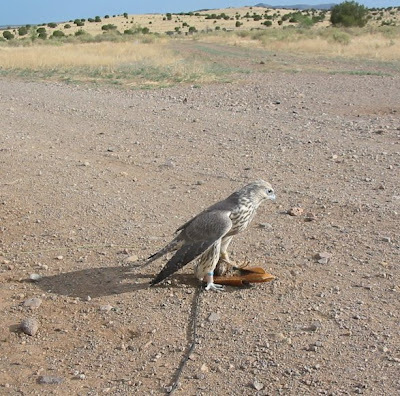 I can see the parrot- falcon connection but some of these are unexpected! I suspect I will be doing periodic updates. HT John Carlson at Prairie Ice. Maybe– 2 1/2?– cheers for the Heller decision. A lot of people still want to load it with enough restrictions to make it meaningless, but at least the principle is affirmed. Funny how so many people want the WRONG interpretation to be kept– even though most scholarly opinion, including that of such honest liberals as Laurence Tribe, affirms “originalist “intent. Stingray of the Nerds has a more rigorous take here. I’,m inclined to agree, with LabRat’s caveat about violent felons. Could this be the new counterculture? Someone born before 1970, help me out, here. I’m too young to have known the last one. They call it steampunk, an aesthetic and a subculture “that simultaneously embraces burlap and iPhones.” Whatever it is, I kind of like it. This more-than-retro computer keyboard first caught my eye. Then this video showing the artist who created it making a companion flatscreen in similar Victorian fashion. Call me crazy, but that’s artistry. That’s craftsmanship. That’s a $300 Dell monitor with brass fittings and a marble stand! Maybe this is just the new Creative Anachronism, a twist on something we’ve seen before. Folks who just like being different, camping out in every sense of the phrase. We like different. No real complaints there. But where the medieval times and civil war reenactors typically chose to stay “in character,” at least for scheduled events, these steampunk folks seem to pick and choose what they like from both current and their preferred eras, blending them into a full time style of life. There looks to be some selective rejection of the trappings of consumer culture here, a positive trend. Some effort to exert a little control over the forms. There is some nostalgia here, too, although none of these people can be old enough to have real memories of mechanical typewriters or telegraph machines. So is the nostalgia more basic, a yearning for an analog, push button, personal touch technology that has somehow been buried in decades of molded plastic? I find this an appealing aesthetic in the way the movies Dune and the more recent Golden Compass married the steam-engine and digital worldviews. It adds a sense of solidity to everyday items we’ve come to see as disposable. In this sense, I think it reflects a similar impulse to the one driving the “slow movement” of organic farming and sustainable living. Although my interests in falconry, coursing, cooking, writing, gardening, acoustic music, etc., predate my recognition of these activities as possibly “nostalgic,” I can now see that as part of their satisfaction. But they are all also contemporary and living forms of art; they are not merely affectations. Like this steampunk aesthetic, if I read it right, these hobbies and pursuits are manifestations of an appreciation for real life, tactile and lasting, wherever you find it. The news we passed along a couple weeks ago regarding the “discovery” of an unknown rainforest tribespeople turns out to have been fabricated, somewhat. In fact, the people are real, but their existence and location have been known for 100 years. Evidently, the photographer felt it was time to give rainforest protection another PR shot in the arm. Squirrelus americanus. 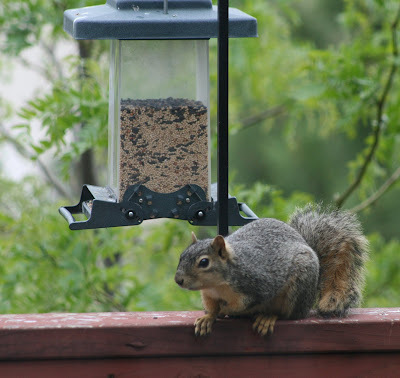 This poor fellow was quite frustrated trying to get into the squirrel-proof feeder. But judging from the chewed up cones under our pine trees, he’s doing okay in the pine nut line. Don’t know how I hadn’t found it before (or for that matter exactly how I did) but Bookride may be the best bibliophile site I have ever seen. It is written by a long- time bookseller with a shop in Charing Cross Road, for people like me– people who in the words of Albuquerque bookman Jerry Lane are in need of a “book muzzle”. It is literate, erudite, and at times laughing- out- loud funny. It is very English if you like such things– I do– and utterly without genre snobbery, or any other kind. It impartially covers “literature”, children’s books, crime, sci- fi, science, military books, erotica, photography, and any other category you can think of, from the Renaissance to the present, from books worth $25 to $90,000. 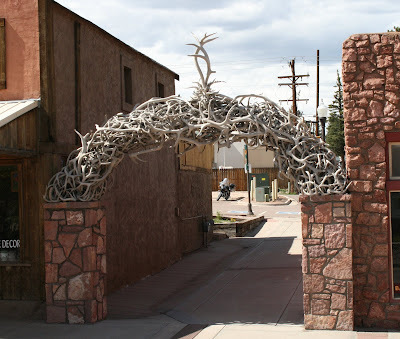 I kept forgetting to post this picture of a great antler arch we saw in the town of Woodland Park while on our way to the Florissant Fossil Beds some days back. 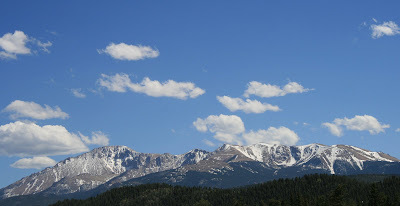 Also, great views of Pike’s Peak from Woodland Park. Wonderful news for us coffee junkies that long-term coffee drinking does not appear to increase a person’s risk of early death and may cut a person’s chances of dying from heart disease. Between the recently documented benefits of drinking coffee and red wine some of us have a good chance of living to 150 or so. The deep, cold fresh waters of the Great Lakes seem to provide the best environment for the preservation of old shipwrecks. The latest example is the 1780 wreck of the British warship HMS Ontario recently found at the bottom of Lake Ontario. 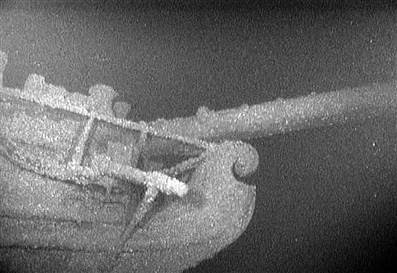 According to this report the ship is the oldest wreck ever found in the Great Lakes and is in an excellent state of preservation. I thought this picture was kind of a teaser and have been looking for more. Let me know if you guys find any.